Founded nearly thirty years ago, Canadian Exciter are among the pioneers of the speed metal movement. Although guitarist John Ricci is the only remaining original member, there is no lack in quality. 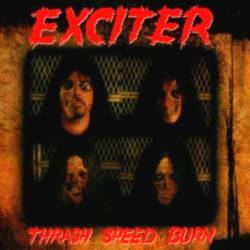 On their first new album since Blood Of Tyrants, released already eight years ago, Exciter are back with a new vocalist and on a new label, but otherwise there hasn’t been much change on the fittingly titled Thrash, Speed, Burn. Exciter fans therefore get what they are used to from the very first song on, conveying retro feelings to nostalgic thrash metal veterans. New vocalist Kenny Winter is able to use his voice as well for deep as for high registers, which works especially well on Demon’s Gate. Exciter put a lot of emphasis on speed, making their songs a real treasure for diehard headbangers. The two quieter tracks Hangman and Betrayal add some welcome variety. It’s hard to write much more about Exciter, as they still do what they always did. The songs are all rather accessible, and there is not a single weak song to me made out. Those who are into old school speed metal like Flotsam & Jetsam, Overkill and Metal Church, should definitely check out Exciter who never really got out of the underground. Thrash, Speed, Burn is another speed metal milestone which makes me hope that Exciter add another thirty years to their career.